Critically ill patients are facing long delays in A&E because of a lack of hospital beds, according to doctors. Senior members of the British Medical Association say while people with minor injuries are being seen more quickly, those with life-threatening conditions are still waiting hours for treatment. They warned that the situation will only improve if the government increases capacity in the NHS by opening more beds, recruiting more staff and spending more on A&E. Ministers have pledged that no patients will wait more than four hours to be seen in A&E departments in England by 2004. In a report published on Thursday, the BMA acknowledged that some progress had been made towards meeting this target. Many hospitals have introduced a new "see and treat" system, whereby patients with minor conditions are assessed and treated quickly. 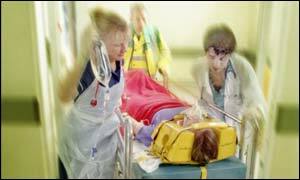 Mr Don MacKechnie, chairman of the BMA's A&E committee, said the system was proving effective. But he warned that there had been little difference in the treatment of critically ill patients. "The government has stated that by the end of March, 90% of patients will wait less than four hours in A&E. "To help achieve this, the government has started to implement a 'see and treat' initiative where an emergency nurse practitioner and senior doctor see patients with relatively minor complaints early on arrival. "Although this does have a significant impact on waiting times for minor cases, the more seriously ill patients can continue to experience lengthy delays while waiting for a hospital bed to become available." While backing the 'see and treat' scheme, Mr MacKechnie warned against diverting key medical staff away from seriously-ill patients in an attempt to meet targets. "We would also be concerned if doctors and nurses were removed from those areas of A&E where the sickest patients are, just to allow waiting targets to be met. "Any new initiatives must be implemented for sound clinical reasons and not introduced simply as 'window-dressing' to improve the overall waiting times for patients." But Mr MacKechnie said the key problem was a shortage of hospital beds. "A&E departments are working under intense pressure and hospitals have very few available beds to accommodate sudden rises in emergency patients," he said. Mr MacKechnie also questioned government claims that spending on A&E services had increased in recent years. He suggested that the extra money was not being seen on the ground. "We have heard a lot about the increased funding for the management of patients in emergency care and we hope the government's financial commitment to emergency services will soon be more visible on the frontline to enable appropriate solutions for the benefit of all patients to be found and introduced." A Department of Health spokeswoman rejected the BMA claims. She said there was no evidence 'see and treat' schemes had lengthened waits for those who needed major treatment. "In effect, 'see and treat' slightly increases the time nurses and doctors have for patients needing major treatment as queues don't build up for minor treatment," she said. Two out of three patients now spent less than four hours from arrival to admission, transfer or discharge in A&E, according to the department. In addition, 90% of those in need of admission are found a bed within four hours, the spokeswoman said. But Dr Liam Fox, shadow health secretary said: "We strongly suspect that patients with minor problems are being pushed through casualty quickly to make numbers look better whilst patients with more severe problems are being left behind."